(Born 19 October 1952) is a British Conservative Party politician and Member of Parliament (MP) for Wellingborough constituency. Bone was educated at Westcliff High School for Boys until 1971 then Chart Tutors – now part of Kaplan – until 1974. Bone is quoted as playing cricket as a left arm bowler for Cambridge Methodists Cricket Club in Leeds and tweets regularly of his matches playing with Wellingborough Old Grammarians 3rd XI. He states that he is a keen follower of American Football and had a question read out live on Sky Sports in January 2012. He is an active member of the Church of England and attends St Mary’s Church in Rushden with his family, as well as holding constituency surgeries in the church hall. In 1977 Bone was elected as a councillor to Southend-on-Sea Borough Council, where he served for eight years until 1986. He was elected as the Deputy Chairman of the Southend West Conservative Association in 1977 and continued in the position until 1984. In 1982, he became press secretary to The Right Honourable Paul Channon MP. He contested the parliamentary seat of Islwyn in the South Wales valleys at the 1992 general election against the Leader of the Opposition Neil Kinnock. Bone’s 6,180 votes remains the best Conservative result in this Labour stronghold. He subsequently fought the European Parliament election in 1994 for Mid and West Wales coming third. Bone was a member of the National Union Executive Committee between 1993 until 1996. He was chosen for the seemingly safe Conservative seat of Pudsey following the retirement of the veteran MP Giles Shaw at the 1997 general election but lost following a swing of 13.20% to the Labour’s Paul Truswell, compared to a national swing of 10% from Conservative to Labour. 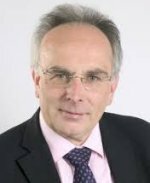 In the 2001 general election he fought the ultra-marginal seat of Wellingborough, where the sitting Labour MP Paul Stinchcombe was holding on with a majority of just 187, having defeated the veteran Tory MP Peter Fry in 1997. Stinchcombe held on to his seat by 2,355, a swing of 2.1% to Labour compared with a national swing of 1.75 to the Conservatives. However, four years later, in the 2005 general election, Bone ousted Stinchcombe in Wellingborough with a majority of 687 votes, a swing of 2.9% compared to a national swing of 3.1% to the Conservatives. He made his maiden speech on 7 June 2005. Bone is “too old to hope for any extended career on the Conservative front-bench”, but is regularly one of the ten most active MPs in Parliament, in terms of Questions asked and other contributions. However the quality of those interventions was questioned in a 2006 Times article about the Theyworkforyou website. Bone was one of three new attention-seeking MPs specifically mentioned who boosted “their ratings on the internet by saying very little, very often.” Among his 109 “speeches” was one, which ran to three short sentences (standing up for Royal Mail in that a sub-postmaster in Little Irchester had the only business in the village). Bone is a member of the 1922 Committee and was an executive member from 2007 to 2012. In April 2012, the Telegraph reported that the modernising “301 Group” was planning a coup to replace Bone and others. The reformers argued that the 1922 Committee was “run by a group of mostly cantankerous old farts who do little to further right-wing ideas” and needed to campaign on issues other than EU membership and their objections to House of Lords reform because it made the party appear out of touch. Bone was voted off the executive in May 2012. In March 2009 Bone was a key speaker opposing the use of the House of Commons by the UK Youth Parliament. Bone was a member of the Trade and Industry Select Committee from 2005 to 2007 and was a member the Health Select Committee from 2007 to 2010. He has been a member of the Joint Committee on Statutory Instruments and the Commons Committee on Statutory Instruments since 2005. In 2010, having unsuccessfully contesting the chairmanship for the Health Select Committee, he was elected to Speaker’s Chairman Panel and the Backbench Business Committee. Further to this, Bone has served as Chairman of the All Party Parliamentary Group on Human Trafficking, Treasurer of the APPG on Human Trafficking of Women and Children and APPG on Road Trafficking. Bone has been frequently critical of the coalition and the Liberal Democrats and is rated as one of the Conservatives’ most rebellious MPs. In February 2014 The Times newspaper revealed that Bone has been under investigation by the Police for the previous 12 months as to his possible involvement in an alleged £100,000 fraud relating to local authority benefit payments of care home fees for his mother-in-law. Bone issued a lengthy statement denying fraud allegations.